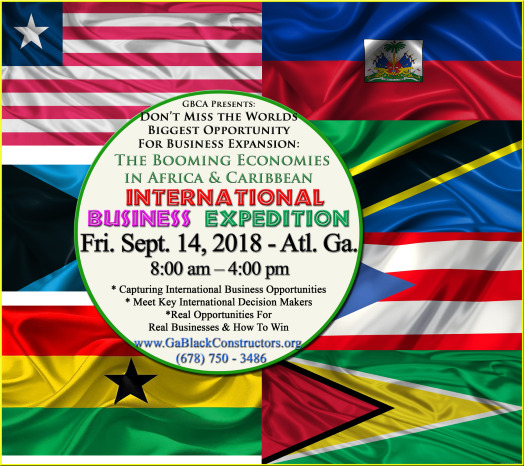 For the first time in Atlanta, Universal Consultants & JMAX Construction Group, with the Georgia Black Constructors Associaton, will host The International Business Expedition, on Friday, September 14th. As you are aware, over the last few years up to seven of the world’s ten fastest growing economies have been of African countries. At this event, you will meet important business leaders and senior government officials from several rapidly expanding African and Caribbean economies. These world leaders are here to present to you real, current, and available business opportunities worth tens of millions of dollars. The International Business Expedition is your first step to expanding your business worldwide.